In a public signing ceremony, global wind industry leaders Envision Energy, NGC, CLCP and AMSOIL officially became strategic partners in the world's largest renewable energy market. 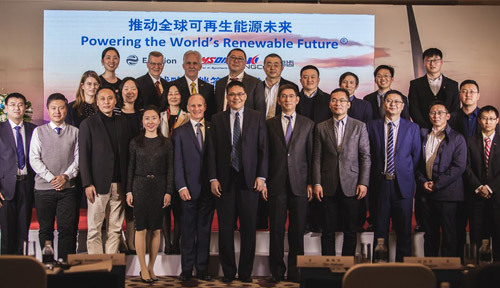 The China Wind Energy Association and other guests gathered in Beijing to witness the wind energy leaders signing the "Powering the World's Renewable Future" agreement. The partnership leverages proven expertise and innovation from four sectors within the industry: lubrication from AMSOIL, smart energy technology from Envision, gearboxes from NGC and service from CLCP. Collectively, the partnership will provide a comprehensive array of wind industry products and services to support rapid growth in an already exploding market. "We're excited to join NGC, CLCP and Envision in this strategic partnership," said AMSOIL President and CEO Alan Amatuzio. "Our organizations share the same high standards of innovation, service and quality, and our combined leadership supports an ambitious vision for the future of renewable energy." "Being young, successful and fast-growing are not the only reasons for our cooperation. Innovation and focus on customers are as well," stated Global Vice President of Envision Energy Kane Xu. 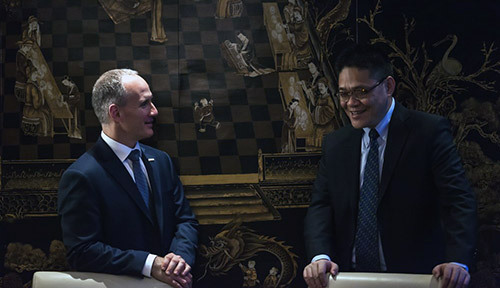 "It's a great pleasure to witness this strategic cooperation among the leading wind companies from China and the U.S.," remarked Qin Haiyan, secretary general of the China Wind Energy Association and vice president of the World Energy Association. At a time of strained U.S.-China relations, the signing ceremony is a bright spot of collaboration between Wisconsin-based AMSOIL and three Chinese wind industry leaders. The strategic partnership is a perfect example of pioneering companies working together to address climate change while enhancing economic development, including meeting the goals of China's Wind Energy Development 13th Five Year Plan and One Belt and One Road initiatives. The agreement advances global wind energy development, deepens international cooperation and will truly "Power the World's Renewable Future." AMSOIL combines next-level service with advanced lubricants to extend gearbox life, reduce maintenance and enhance performance, making it the OEM factory-fill and service-fill choice for the global wind energy market. For more information, visit www.amsoilwind.com. Follow AMSOIL on LinkedIn, Twitter, and Facebook. Envision Energy is the world's leading provider of smart energy technology solutions, smart wind turbines, smart wind farms and smart grids. Envision is the second-largest turbine manufacturer in China and has facilities in Denmark, the United States, Japan, Shanghai, Beijing and many other cities across China. NGC is the world's largest manufacturer of wind power gearboxes with a market share of approximately 70 percent of China and 30 percent of the global main gearbox market. The company also produces pitch and yaw gearboxes for the wind energy industry and maintains strong relationships with clients. In addition to strong sales, NGC continuously innovates and invests heavily in research and development. CLCP offers gearbox lubricant management and wind farm maintenance technical services by providing customized operation and maintenance services for wind farm owners. The firm also acts as a distributor of the world's highest quality lubricants. AMSOIL CEO & Owner Alan Amatuzio chatting with Envision Energy Global Vice President, Kane Xu. 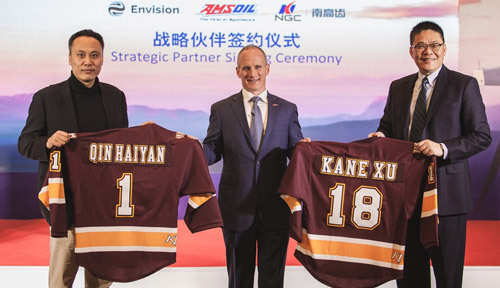 AMSOIL Owner & CEO presents custom University of Minnesota Bulldog Hockey Jerseys to the President of the China Wind Energy Association, Qin Haiyan, and Envision Energy Global Vice President, Kane Xu. The number one jersey is because China is the world's largest wind market, the number eighteen which means “to prosper” in Chinese numerology. The numbers were also relevant because the event took place on 1/18/2019. Representatives from AMSOIL, Envision Energy, China's largest wind farms and global wind turbine and gearbox original equipment manufacturers. It is traditional to gather as family at the Chinese Spring Festival! © 2019 AMSOIL INC. All Rights Reserved.